The Bulldogs look poised for a big jump in 2017. We’re closing in on the final 10 of The Comeback’s Top 50 countdown. As part of our 2017 college football preview, the list gets shorter each day, leading up to the opening of the regular season. Up next at No. 15, the Georgia Bulldogs. At the end of the 2015 season, the Georgia Bulldogs made the very tough decision to move on from Mark Richt, one of the most loved and respected coaches in college football. Georgia football was stuck in a period of “good, but not great” and the decision was made to go in a different direction. The Bulldogs went with former Georgia defensive back and long-time Nick Saban assistant Kirby Smart. Year one was a tough start for Kirby and the Dawgs, as Georgia went a pedestrian 8-5 overall and 4-4 in the conference. In his second year as head coach, Smart looks to take a big step forward with Georgia this season. Smart had a rough first year at the helm for Georgia. After a 3-0 start including a season-opening win over North Carolina, the Dawgs lost four of their next five games. Georgia had some very close losses that they probably should have won (Georgia Tech, Tennessee, Vanderbilt), but they also had some games that they very easily could have lost (Missouri, Kentucky). Georgia had a tough time in 2016 putting everything together at the right time. Last season showed Georgia fans a lot of promise with the play of the defense in spots and the talent that quarterback Jacob Eason possesses. Did Georgia make the right hire with Kirby Smart? But more questions than answers were created in 2016. Only time will tell, but 2017 will go a long way in defining the legacy that Smart will have at Georgia. If there is one thing that we know Kirby Smart excels in, it’s recruiting. After finishing sixth in the country in recruiting last year, the Dawgs ranked third this season (behind only Alabama and Ohio State). Georgia nabbed 2 5-star recruits and an incredible 19 4-star recruits. Due to necessity, offensive lineman Isaiah Wilson has the biggest opportunity to make an impact. Due to talent, it’s going to be hard to keep defensive back Richard LeCounte III off the field. Due to lack of star power, Jeremiah Holloman is a name that could make an immediate impact at WR. Another player to keep an eye on is late signee Ahkil Crumpton. Georgia is looking at him to replace Isaiah McKenzie in spots. 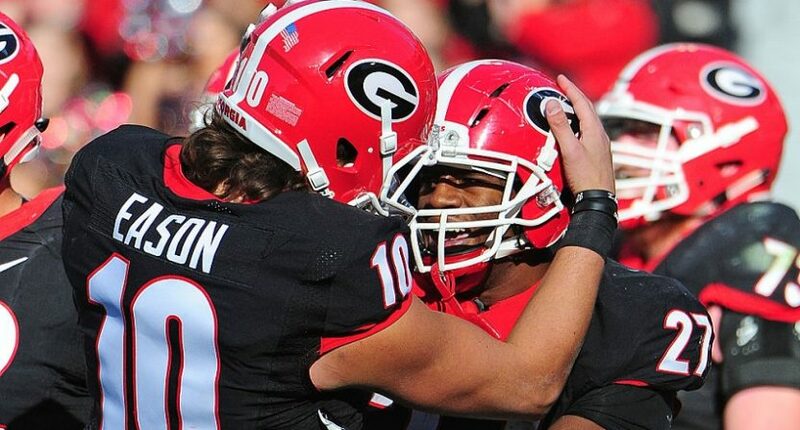 48 – The number of plays that the Georgia offense had that resulted in 20 or more yards gained. This was the worst in the SEC and a reduction of 17 plays versus the prior year. In short, Georgia was less explosive than the previous year which meant having to sustain longer drives with a much more inexperienced quarterback. 56%– Georgia converted just 56% of their red zone trips into touchdowns. This was 12th in the SEC and 100th in the Nation. 54.9%– Georgia’s completion percentage in 2016. It as a decrease of six percent from the prior year and ranked 11th in the conference. One of the reasons for the decline was having a freshman quarterback who was instructed to get rid of the ball instead of making a mistake. The level of improvement in Jacob Eason’s in-game acumen will be huge in 2017. Why it matters: Georgia plays five rivalry games every season. So why does this game matter so much? It’s because of where it falls in the schedule and how important it is for Georgia to come out of the gates strong at the beginning of the season. Notre Dame is an unknown in 2017. The Irish lost eight games in 2016, but only lost one of those games by double-digits. They are a wounded animal and are in need of a statement victory. Georgia needs this win against a desperate opponent in a hostile environment. Why it matters: Last year, it took Georgia fans just 10 seconds of game time to experience the thrill of victory and then the agony of defeat. Butch Jones has flipped the script on the Dawgs by winning the last two games in this rivalry. Kirby Smart needs to beat the Vols — not only because it’s a division game, but because Georgia can’t afford to lose three straight to Tennessee. Why it matters: Anybody who watches catch football understands why Georgia needs to win this game. This is one of the elite rivalries in all of college football. Florida has owned the rivalry since 1990 by winning 21 of 27 games. Kirby Smart and Georgia need to win this game. Period. 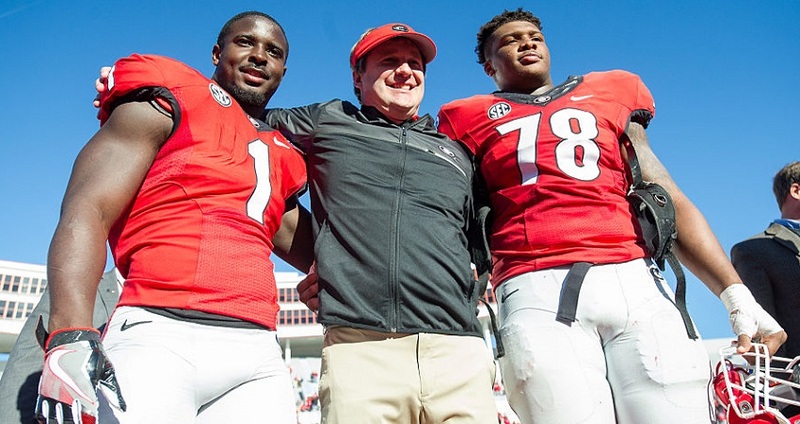 Nick Chubb/Sony Michel, RB – I cheated by listing Chubb and Michel but it’s because they are both so special and so instrumental in Georgia’s success this season. Chubb was not himself last year coming off of his injury but with another year to recover he is looking to get back to being the destructive force that he is known to be. If Georgia can utilize Michel more all over the field he could be the most important player in Georgia’s offense. Jacob Eason, QB – Eason had some big time moments as a freshman. He also struggled as you expect a freshman quarterback will in the SEC. Whether or not Eason has made big strides from his freshman to his sophomore campaign will be what puts Georgia in the SEC Championship Game or keeps them on the outside looking in. Eason has some of the best talent in the nation at running back and tight end. If some of the receivers can get on the same page as Eason and the offensive line improves, Georgia’s offense can go from pedestrian to above average very quickly. Lorenzo Carter, LB – Georgia has a ton of talent on defense and Carter might be the most talented. Carter finished the season tied with Trenton Thompson and Davin Bellamy with five sacks and he added six tackles for loss. Carter has a knack of being in the right place but at times struggles to complete the play. If Carter can finally put it all together for Georgia, he could be the difference maker in taking an above average defense (16th nationally in total defense last season) and making it elite. Georgia will beat Florida and Tennessee in the same season for the first time since 2013. It’s interesting to note that in 2013, Georgia finished third in the division because they lost to Missouri and Vanderbilt. The key for Georgia if they win these big rivalry games is to make sure they don’t slip up against the other teams in the division. Georgia will head to the SEC Championship Game for the first time since 2012. It will come down to a toss up between Florida and Georgia for who will represent the East and one big play or one big mistake could make the difference. The SEC East is the little step-brother of the SEC West, but it’s going to be a wild ride this season to see who can step up and try to unseat Alabama.